Public Works and the San Rafael Sanitation District work around the clock to make sure that our infrastructure is functioning properly: our roads, traffic signals, sewers, bridges, City buildings, and more. Last week we opened our doors to City staff, residents and the community members of San Rafael for a behind-the-scenes look in to what goes down at “The Yard”. Over 65 community members attended the open house to tour our facility, check out our equipment and vehicles, learn about our critical infrastructure, and our active and upcoming projects. 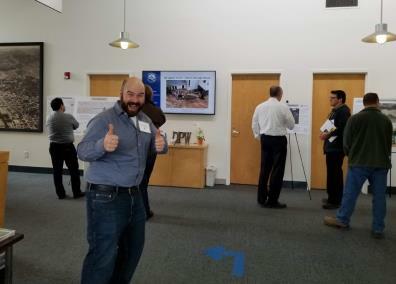 Attendees were given the chance to meet and interact with the staff responsible for leading these essential projects. One of the many fun facts attendees learned was that we fabricate 80% of the City’s street signs in house! If you missed the open house, don’t worry; we’re open Monday through Friday from 8 a.m. to 5 p.m. to assist you and to answer your questions. If you’d like to meet with staff on a particular Public Works-related topic, feel free to give us a call beforehand at (415) 485-3355 (to make sure that our staff will be available) or contact us at www.cityofsanrafael.org/contactDPW.